String quartet 4, opus 33. 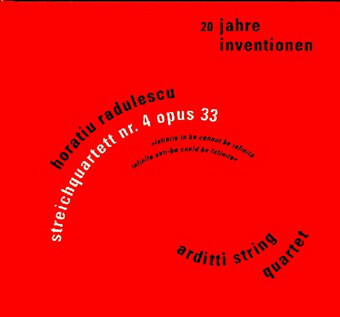 "infinite to be cannot be infinite, infinite anti-be could be infinite"
String quartet No 4, opus 33 (1976-87)", Arditti String Quartet: Irvine Arditti, Graeme Jennings, Garth Knox, Rohan de Saram. For nine string quartets or one string quartet surrounded by an imaginary Viola da Gamba with 128 strings.